I should've written this post weeks ago when I actually finished this book, because I've forgotten a lot of what I wanted to say. So I briefly considered not writing a post at all, but the book was so good (that I do remember), that I at least wanted to recommend it. 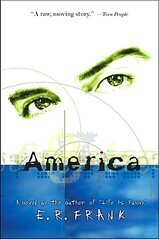 The story follows a kid, named America, that basically gets lost in the foster care system over and over again. Some horrible things happen to him, and he is shuffled around to different group housing situations. If this were all it would be a pretty average book, but it is really raw and genuine emotionally. The author is very skilled at relating America's emotional state, and how sometimes the least little things can set a person off, and how counseling takes forever and three days to actually work, and what happens to a person's soul when they can't trust anybody at all, because no one sticks around long enough. It's just a really authentic, not at all corny, book. This is a pretty good book, I guess especially if you are interested in teen homelessness. The author does a really good job of being honest about what it is like to be homeless, without vilifying or glorifying the topic. I appreciate the dirty grimy details of life on the streets, but it was clear that however bad it was, for those kids it was better than what they had been dealing with at home. And it definitely wasn't all about drugs, although that was part of it for a lot of the characters in this book. It was interesting comparing this fictional book to Living at the Edge of the World: How I Survived in the Tunnels of Grand Central Station, by Jamie Pastor Bolnick, which is a non-fiction book written by a formerly homeless teen. And based on what Bolnick said, the descriptions and realities in this book are fairly right on, even to the point of teens living in "tribes" and the extent of totally slimy creepy people who are looking to take advantage of these kids.